The first time the men and women set out to dig for their missing relatives in Iguala, they didn't know how. Leaders of the expedition told them to look for discoloration in the dirt, evidence of recently turned soil. Look for depressions in the ground, they said. That may signal a clandestine grave. They headed for the mountains with picks and shovels, and stopped at a field where someone recalled having detected a foul odor. Amid purple and yellow flowers, they dug - 10 centimeters, 20, 40. At 60 centimeters, they hit a human bone. The gravediggers cried and prayed, and kept burrowing into the ground until they had unearthed six graves. "We knew we were going to look for buried bodies, but we never imagined that was what we would find," said Mario Vergara, whose brother had disappeared two years before. "What we saw broke us." The expeditions began shortly after 43 students from a rural teachers college were detained by police in Iguala on Sept. 26, 2014, and vanished. Emboldened by a national uproar over the students, and eager to find their own relatives, hundreds of families came out of a scared silence to report kidnappings for the first time, adding names to a list of 26,000 missing nationwide. About 30 people gathered at the first meeting in the basement of the San Gerardo church, where each family told a story worse than the next about how their relatives went to work one day and never came home, or how armed men took them from their homes, or how they were last seen at police roadblocks, and then never heard from again. They gave DNA samples and decided to scour the verdant mountains of Iguala for their abducted sons and daughters, spouses and siblings who became known as "the other disappeared." The remains of Gerardo Alcocer's son, Gerardo Alberto, were among those recovered on that first excursion. Alcocer's epilepsy prevented him from joining the search parties. He is grateful for their efforts, though they brought heartache. "In life, children are supposed to bury their parents, not the other way around," Alcocer said. "And it feels awful, too awful." In the early days, Miguel Angel Jimenez, an activist and community police officer, taught the searchers to look for campsites, because traffickers often held their victims for ransom before killing them, he said, and the graves could be close by. They searched through thickets and thorny acacia trees for garbage and shreds of clothing, and saw that some of the tallest trees had steps cut into their trunks so lookouts could climb into the canopy. They found hot plates and disposable cups, beer, whisky and tequila bottles. "Farm workers don't use disposable plates," Jimenez said, according to another gravedigger, Xitlali Miranda. Jimenez eventually parted ways with the group and was shot to death last summer. As with so many killings in the area, no motive has been established and nobody has been charged with the crime. For the first two months, the families went out daily to the mountains of northwestern Iguala. They tried to search in an organized manner, walking in a line to comb an area, but within a few minutes they'd usually break ranks and spread out across rough terrain. "We're a bit disorganized," Miranda said. Authorities quickly prohibited them from digging up the graves themselves, saying they had broken bones and contaminated crime scenes. But the families didn't stop looking. Instead, they started using metal rods as a detection device: They push a rod into the ground and if it smells when they remove it, they know they have a grave to mark with a flag for authorities. "The more recent the body, the more it smells," Miranda said. "Like rotting flesh. It's a penetrating smell. It gets inside you and you end up smelling like you still had the rod. It's not a smell that goes away." But there was a learning curve. Miranda said the rod is not foolproof. "There are older bodies and they don't smell. We know now that not even the rod is 100 percent accurate." After the families mark the suspected gravesites, authorities move in with a forensic team, a detective and an anthropologist escorted by federal police. They start by filming and photographing an area, then set up posts and run string from side to side to make a grid. They dig in each square with shovels and picks until they think they are close to human remains and switch to a mason's trowel. Once they find a bone, they switch again to a brush to remove the dirt. Then they film and photograph the area once more before removing the bones one by one and placing them in boxes to take them to forensic labs in Mexico City. Even though the authorities tell the families not to interfere, sometimes the anthropologists ask for help. "I have gone into the graves to dig. 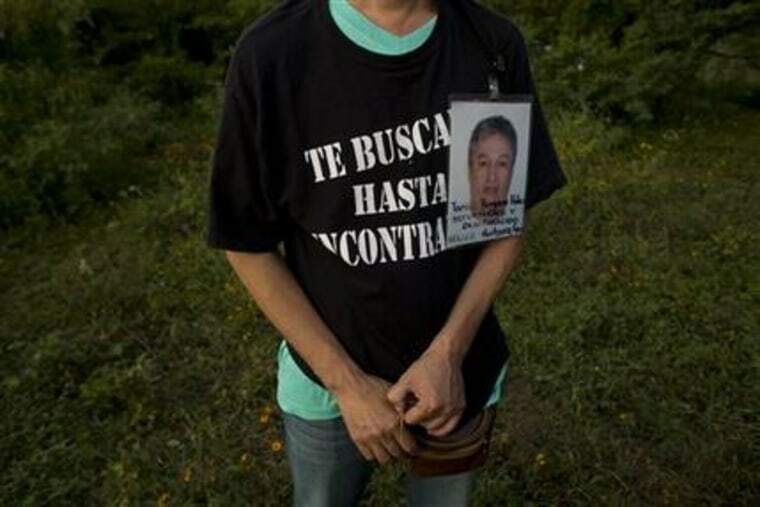 I pick up the little bodies, the skeletons," said Bertha Moreno, who searches for the remains of her son, Manuel Cruz Moreno, a construction worker who was 21 when he disappeared in Iguala on Jan. 2, 2009. At first, the diggers almost always encountered at least one possible gravesite each day. But as the weeks wore on they found fewer and fewer graves, and scaled back to searching only on Sundays. Each week about 15 people, most of them women, assemble at San Gerardo church at around 10 a.m. and set off. They return about five hours later with scratches on their arms and legs and dirt in their shoes. Before suspending their search for the summer rainy season, the diggers had located more than 60 clandestine graves with the remains of 104 people, all but 13 of them still unidentified. When the families resumed the search Nov. 8, they found what appeared to be human remains, and in the following days they found more. The authorities have exhumed the remains of 11 more bodies, some of them with police uniforms. Moreno is among those who have given up Sunday Mass and dozy afternoons with family to search for her son. She believes God will forgive the lapse in her religious duties and protect her, even if her husband does not agree with her decision to risk the wrath of gangsters who are likely responsible for so many disappearances. "He lectures me. He says, 'Don't you see the danger?'" Moreno said. "But I don't mind giving my life to see (my son) again." Moreno lost her job cleaning the house of a teacher, who said the grave diggers were troublemakers putting everyone in danger in a region dominated by drug traffickers. Moreno pushed back. "'How are we troublemakers if we're looking for our relatives?'" she said. "And she fired me." Moreno realizes it is not normal to search for the dead on Sundays, but in Iguala it has become normal. "It is something our heart asks of us," Moreno said. "And it makes us feel, well, even good."